We’re in Janvrins Island. An Island off an Island. But that doesn’t stop us. We cover all of Cape Breton, and even some of the mainland: we’ve done quality work throughout Antigonish and Guysborough Counties. No job is too big or too small. We have an expert team of qualified trust-worthy electricians, carpenters, installers, ready to assist your next project. We’d love to hear from you. Our staff are professional and our business is fully-insured. We have been in good standing with the Workers’ Compensation Board of Nova Scotia for many years. All our staff are Fall Arrest and First Aid certified. We don’t take chances when it comes to our customer’s satisfaction. We love seeing a job well done and a happy customer. 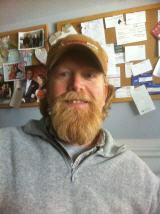 Brian started Appleseed Energy in 2008 with friend Ross MacDonald. Originally from Indiana, Brian, and his wife Gina, now call Janvrin’s Island Home, where they have been living off-grid since 2001. From the early days, it was clear their focus should be in solar. It was a free source of energy that people wanted. It’s a very technical business, so Brian spent his time learning all there is to know about solar and off-grid living. The business has grown to 5 full-time employees and they’re now installing over 1000 panels a year! Appleseed have completed projects far and wide, big and small. It’s testament to their enduring hard work that whenever they meet a previous customer out and about in the community, they are always happy to see Brian and his team, and report how much they love their solar system.